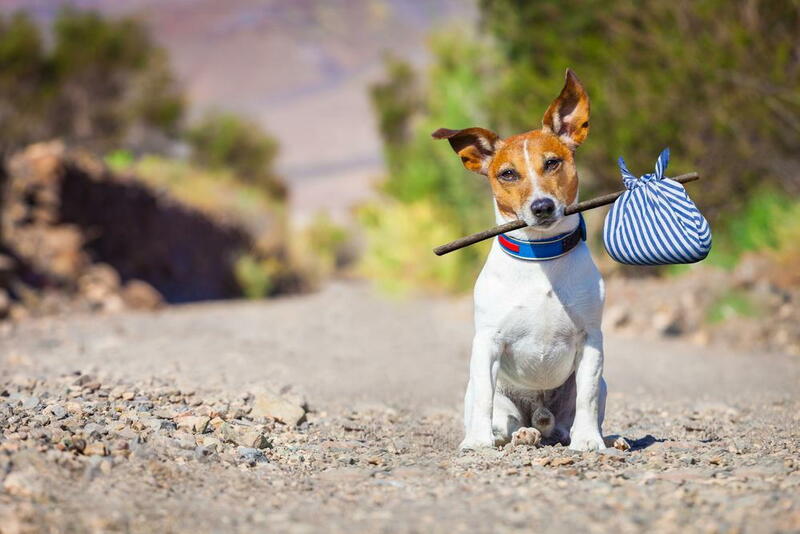 The summer is the perfect time to travel with your pet. Whether you are planning a road trip to a national landmark or simply driving to a campsite for a weekend getaway, it’s important to take steps to keep your pet safe while traveling. Consider the following tips before loading up or contact our veterinarians, Dr. Armstrong and Dr. Reisenger for general advice. The best thing to do to keep your dog safe while camping is to prepare ahead of time for your trip. First, research and locate dog-friendly campsites or ask our vet for recommendations. Bring along a collar with an attached tag containing your pet’s identification in case he gets away. Also, check with our veterinarian in Helena to make sure your pet’s vaccination records are up-to-date and consider a microchip if you haven’t already done so. Make sure you bring water bowls, a sleeping pad or bag to keep your pet comfortable at night, a reflective leash and collar, and perhaps a clip-on flashlight. You are the only one who might need an emergency first aid kit during your travels. Many of the items you probably already have at home. In the kit, include a makeshift muzzle or bandana, flat-bladed tweezers or a tick removal tool, an emergency fold-up blanket, needle-nose pliers for removing large thorns, boots or shoes to protect the feet, a first aid book for treating pets, and the phone number for our veterinary clinic. Whether you are riding in a car or airplane, keep your pet safe in a crate. In a car, anchor the crate with a seat belt. The crate should be placed in the back seat or cargo area for maximum safety. Never leave your pet alone in a hot car. Even if it’s 70 degrees Fahrenheit outside, temperatures in the vehicle can rise to well above 100, which can cause heat stroke. There are always inherent risks when flying with your pet. Consider alternative methods to flying when you are going on a long trip or leave your pet with a trusted neighbor or in boarding. One of the most important things to look for when traveling with your pet in the summer is overexposure to heat. Make sure your pet gets plenty of water and keep them in the shade outdoors. Learn to recognize the symptoms of heat stress, which include excessive panting, muscle twitching, excessive drooling, and lethargy. If you have any questions about traveling with your pet, contact the Helena Veterinary Service in Helena MT at (406)442-6450. Our veterinarians are here to help.